Few items in a restaurant dining room can make a statement quite the way the tablecloths do. Crisply ironed tablecloths and starched linen napkins set a distinctly upscale atmosphere. Tablecloths tend to go hand in hand with fine dining—you don't often see them in roadside diners—but restaurant linen is used in many different types of restaurants all the same and with varying results. Restaurant tablecloths offer several benefits. They provide a great way to cover up your tabletops if they're old and nicked, and they're cheaper to buy than new tables. They're also less expensive to replace when they become stained, as they inevitably will. They come in a wide variety of colors and sizes, so they give you many more decorating options. They shout "Upscale!" and can dress up any restaurant dining room. They're also ideal for busy restaurants or restaurants that cater. Whip one away and replace it with a new one with barely a break in stride. Before you run out to buy a bunch of restaurant tablecloths, considered these drawbacks. They're not as sturdy as tabletops. Sure, you can replace them more economically, but rips, stains, and holes will eventually render them useless much sooner than that serviceable tabletop. Tablecloths require a great deal more upkeep than tabletops. 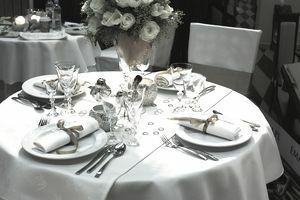 You can just wipe down a tabletop between seatings, but tablecloths have to be laundered, pressed, folded and stored. Then there's the ambiance factor. Tablecloths can send the wrong impression to customers who might be put off by a “fancy” restaurant when all they want is a burger and a beer. But by the same token, diners looking for an excellent Steak Diane might not want to enjoy it while looking down at a bare tabletop or paper placemat. It really depends on your establishment and the type of customers you hope to attract. And nothing says that you can't provide both if you have enough floor space. Consider using tablecloths in the dining room and foregoing them at the tables in your bar area if you have one. Look for professional quality linen. Just like when you're selecting restaurant dinnerware and other commercial restaurant equipment, linen that's designed for restaurants is made to last much longer than tablecloths made for personal use. That's why it's more expensive. That brings us to the math. If you're purchasing tablecloths in an effort to save money when you're first opening a new restaurant, consider that it although it might be cheaper now, it will probably cost you a lot more in the long run than nice tabletops because you have to factor in professional laundry service costs and replacement linens, too. Avoid trendy colors. Today’s hot color will be tomorrow's outdated fad, taking your restaurant dining room out the door with it. White and ivory are always good choices because they never go out of style. Red isn't always bad if your establishment specializes in Italian or Latin cuisines, but other than that, save it for the linen napkins if you feel that you really must have a splash of color. Restaurant tablecloths won’t do you much good if they aren’t cleaned and stored properly. Some restaurants send their laundry out while others take care of this in-house. Sending it out will cost you cash every week, but doing it in-house will cost you more in payroll. Using a professional service is usually the most efficient way to care for your restaurant linen. They'll wash, press, and fold your tablecloths and your employees might even like you more because they don't have to dread this end-of-the-week job.